Flanders Alpha Cell Commercial HEPA Filters are used in filter applications for hospitals, data centers, nuclear facilities, pharmaceuticals, laboratories, aerospace, food processing and optics. The Commercial HEPA Filter Replacement 23.3" x 11.3" x 11.5" Standard Capacity is the correct replacement for the Flanders Alpha Cell 2000 SC. The Commercial HEPA Filter Replacement 23-3/8" x 23-3/8" x 11-1/2" High Capacity is the correct replacement for the Flanders Alpha Cell YY-F HC. The Commercial HEPA Filter Replacement 23-3/8" x 23-3/8" x 11-1/2" Standard Capacity is the correct replacement for the Flanders Alpha Cell YY-F SC. 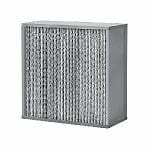 The Commercial HEPA Filter Replacement 24"x12"x11.5" High Capacity is the correct replacement for the Flanders Air Filter Alpha Cell GC-F HC. The Commercial HEPA Filter Replacement 24"x24"x11.5" Standard Capacity is the correct replacement for the Flanders Air Filters AlphaCel GC-F SC. The Commercial HEPA Filter Replacement 24"x24"x11.5"High Capacity is the correct replacement for the Flanders AlphaCel GG-F-HC. The Commercial HEPA Filter Replacement 24"x24"x11.5" Standard Capacity is the correct replacement for the Flanders AlphaCel GG-F-SC. The Commercial HEPA Filter Replacement 23-3/8" x 11-3/8" x 11-1/2" High Capacity is the correct replacement for the Flanders Alpha Cell YU-F HC. The Commercial HEPA Filter Replacement 23-3/8" x 11-3/8" x 11-1/2" Standard Capacity is the correct replacement for the Flanders Alpha Cel YU-F SC. The Commercial HEPA Filter Replacement 23-3/8" x 23-3/8" x 11-1/2" High Capacity is the correct replacement for the Flanders 03-SU-12-00-YY-F HC. The Commercial HEPA Filter Replacement 23-3/8" x 23-3/8" x 11-1/2" Standard Capacity is the correct replacement for the AlphaCel 803SU12YYF. The Commercial HEPA Filter Replacement 24"x24"x11.5" High Capacity is the correct replacement for the Flanders Alpha Cell 11H0803SU1200GCF. The Commercial HEPA Filter Replacement 24"x24"x11.5" Standard Capacity is the correct replacement for the Flanders Alpha Cell 7C0803SU1200GCF. The Commercial HEPA Filter Replacement 24"x24"x11.5" High Capacity is the correct replacement for the Flanders Alpha Cell 11H0803SU1200GG-F HC. The Commercial HEPA Filter Replacement 24"x24"x11.5" Standard Capacity is the correct replacement for the Flanders Alpha Cell 7C0803SU1200GGF.